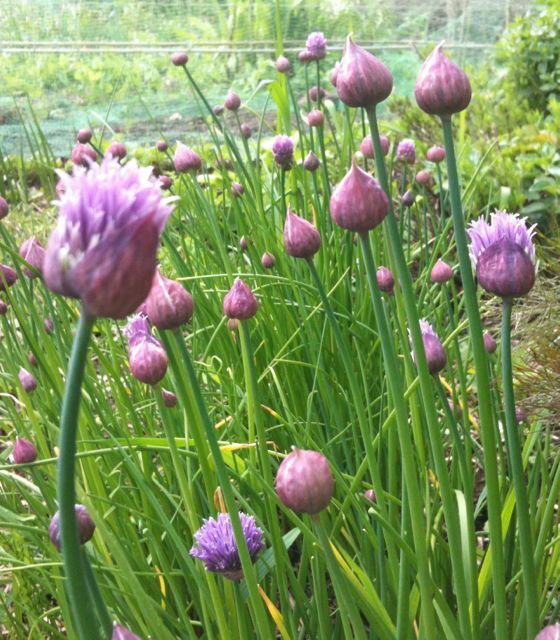 Chives are at their best at this time of year – bursting into purple pom pom flowers and looking strong and fresh in the herb bed. Chive flowers sprinkled over scrambled egg provide a fantastic sweet, oniony crunch that works perfectly with eggs, giving a bolder flavour than just the leaves. And they do look very pretty too…. 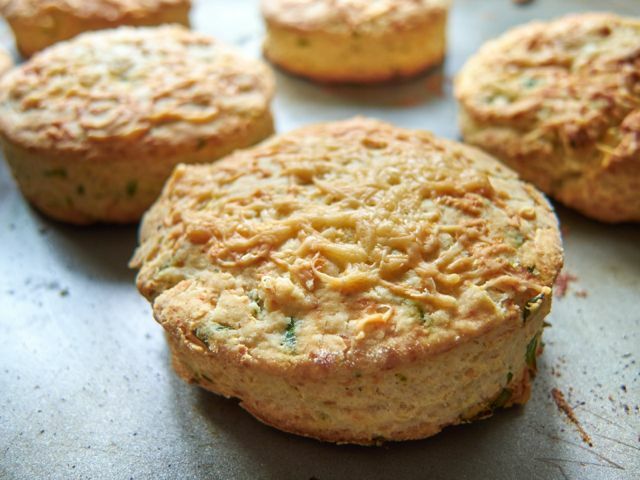 Chives a lso pair up brilliantly with cheese, and make a delicious savoury scone, their mild flavour providing a subtle balance to a good mature cheddar. I’ve used this traditional Northumberland recipe for mine, and served them warm with some fresh asparagus soup. A very English late spring lunch. Mix together the flour, baking powder, salt and half the cheese. Add the butter in small pieces and rub into breadcrumbs. Add the chopped herbs and pepper and mix well. Carefully add the milk and water mixture, stirring gently until you have a soft dough. Roll out and cut into rounds. Place on a greased baking tray, brush with milk and sprinkle with the rest of the cheese. Bake at 220C for about 15 – 18 mins until golden. Chive butter – finely chop chive leaves and / or the flowers and mix thoroughly with a good, salty butter. Great on baked salmon or baked potatoes. Chive flower vinegar – harvest a big bunch of chive flowers, place in a sterilised jar and cover with a good white wine vinegar. Seal and leave in a dark place for a couple of weeks, then strain into a sterilised bottle and use – great as a flavoured salad dressing vinegar. If you have any favourite chive recipes – I’d love to hear about them. Posted on May 31, 2015 by Sarah at Seasoning Works. This entry was posted in herbs, recipes. Bookmark the permalink.